The company launched its first reading game in Norway in 2017, then in Sweden 2018. But the story of Poio takes us all the way back to 2012, the year when Daniel had a son with impaired hearing. This story is about a father who decided to turn a challenge around and make it a solution for tens of thousands of people. Impaired hearing is one of many reasons why children experience difficulties in school. Learning to read is one of the first tasks confronting a pupil. It becomes the foundation for most of the learning that awaits them, and demands a lot of repetitive training. As Daniel talked with scholars and people with similar experience, they confirmed what he had suspected: that learning to read can be exhausting to a child. That struggling with learning can, over time, create negative learning spirals leading to serious consequences. Daniel Senn is the dad, the educationalist and technologist behind Poio the reading game that is helping thousands of Norwegian and Swedish kids to crack the reading code while playing. Poio is one of Schibsted Growth’s portfolio companies within Ed Tech. “I decided that my son was not going to have to go through that. There had to be a way to do something about the learning methods! To create a positive form of learning. On Leon’s terms. So we could avoid him reaching a point where he associated learning and reading with something negative”, says Daniel Senn. After a lot of searching with no results Daniel decided to try to solve the problem himself by working with things that Leon liked. It was going to evolve into an entertaining digital game full of funny characters and exciting missions. But the first prototypes of Poio were made with cardboard, paper and scissors at home on the kitchen table. “In the beginning I played with characters, letters and words together with Leon and his older brother Aksel to see what caught their attention, just with simple methods. One cardboard game that I made together with them turned out an instant success. It was one where the children had to figure out which objects/words the Vowel Monster could “eat”. They wanted to play it again and again. It was fascinating to watch how eager they were to master the game and learn new letters and words”. The road from cardboard figures at home to a digital game started for real in 2015. With the cardboard game as a starting point, a long journey towards developing a more advanced digital prototype began. Daniel had worked on many digital learning games but could not find the equivalent tool for reading training. This led to the family making a choice: Daniel was going to quit his job and together they would put their efforts into making a universal reading game of high educational standard. “I felt an incredible drive to combine all the things I had learnt about game development, teaching methods, communication and aesthetics in order to create something meaningful. Something that could help children in a crucial phase of their development. Not only for my own son but for all children and families who meet challenges with reading training, regardless of age and preconditions. It felt a little shaky to move from a safe and good job into the unknown. But it was a choice we made together, as a family – a choice we have never regretted.” In this project, an essential role has been played by Daniel’s co-founder and game developer Johannes Stensen. “A critical component for the success has been that the two of us have had the skills to develop the reading game on our own with a high degree of confidence in each other, a childish urge to experiment and a willingness to change the concept as we went along and learnt new things. At the same time, we have had a large network of people – including children – who have wanted to help us free of charge.” In order to learn more about how to evoke positive motivation in children, the two have been working closely with educationalists, teachers, professors and other parents. This has helped to ensure good quality content and find methods that could be combined with elements in the game. “Poio is a result of assistance from a large number of knowledgeable people who have contributed with their special competence, experiences and good questions throughout the whole development. Furthermore, they have given us the necessary confidence to challenge established truths about the best way for children to learn to read and confirmed what our guts were telling us: that curiosity, excitement and making reading joyful, are the keys to success”. They have also met several people who have had doubts about using digital games for educational purposes, particularly since Poio has many similarities with commercial entertainment games, where there are few specific instructions and the children have to figure most things out by themselves. “This is one of the main points. For children to spend time on playing Poio it has to be built like that, on children’s own terms and as a real competitor to what the children are already spending a lot of time on. The children themselves must become fascinated by the challenges and feel that they want to learn more, both about the game and about our written language. And on top of that; if the children are having fun they will learn much more”. At last, in the summer of 2017, they could share the reading game Poio with every family in Norway. The launch exceeded all expectations. “The road from our own small family project to a full national launch has been quite incredible. And the need for new tools for learning is clearly big”. They receive feedback every day from parents telling them how their children have been struggling trying to crack the reading code. ”We hear that Poio is part of the reason that they are now reading their first book. That is a fantastic feeling. Our goal is that no child should struggle with cracking the reading code. Some people might find that an unrealistic goal, but I just don’t listen to them”, Daniel says. Poio has become a huge success already during its first year and families all over the country have confirmed what Daniel hoped for. The game engages the children and makes them eager to read, regardless of background. A year later the game now is also available to families in Sweden. Next year, Poio will be moving on to other places in the world. And for those of you who wonder how Leon is doing: he just started school this fall. Now Daniel will find out how the family’s joint project has affected Leon’s reading development. “Leon’s language is now developing in a way that is perfectly normal for his age. And he is very close to cracking the reading code. We are looking forward to his first year at school and we are absolutely confident about his future development, because he thinks learning is fun. Just like it should be for every child”, Daniel says. And what does Leon like most about the game? ”I like that the characters are so different and to steal the letters and get away with it”, he explains. 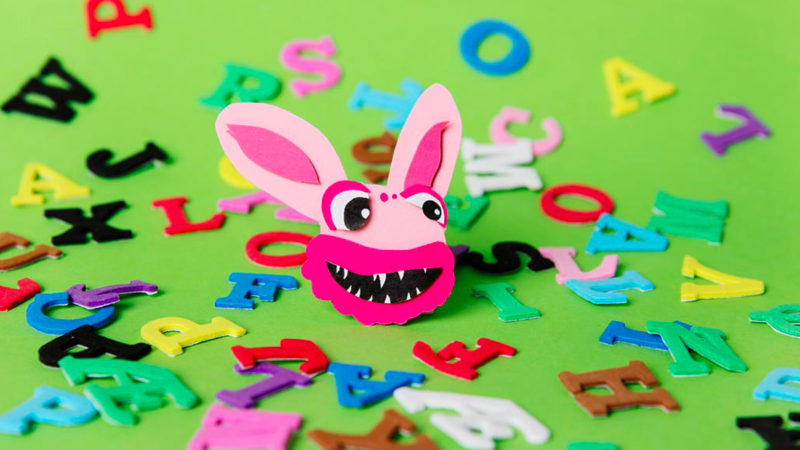 He is also super proud for giving voice to Otto – the pink rabbit with a beard and large fangs. By: Vilde Randgaard, Content manager and producer, Poio.